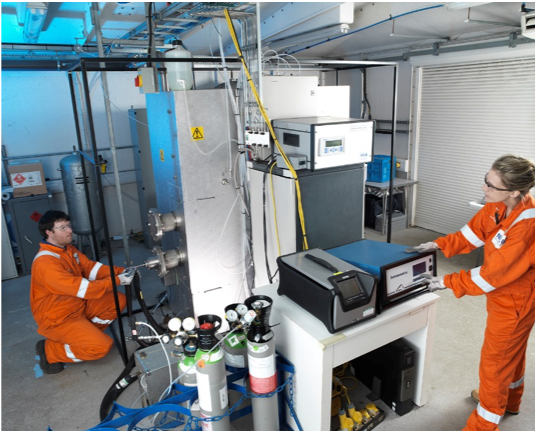 The aim of the Gas Measurement and Gas Cylinder Proficiency Testing Scheme is to assess the performance of test houses in sampling and measuring stack gases, using test atmospheres traceable to National Standards. The scheme involves the measurement of combustion gases (NO, NO2, SO2, CO, O2, VOCs & CO2) directly from cylinders and from NPL’s stack simulator facility, at concentrations and conditions typical of plant falling under the Industrial Emissions Directive (IED). Cylinder measurements can be used for the annual requirement in EN14792 to demonstrate NOx converter efficiency as well as the quarterly requirement to assess NO2 losses for portable measuring systems. A traceable CO2 cylinder is available to allow participants to assess their measurement capability of this increasingly important pollutant. Measurements from the artificial stack give additional information on sampling, i.e. to demonstrate dryer performance for SO2 sampling is in compliance with EA TGN M21 & CEN/TS 17021. The NPL stack simulator is able to reproduce a wide range of simulated stack gases under controlled conditions. The simulator is a recirculating system which recreates a cross section of a 1.5 m duct. Four standard five-inch ports are available for fixed sampling probes or cross stack instruments. Assigned values are calculated by measurement of the gases within the simulator using the standard reference methods or proven equivalent. Standard deviation for proficiency testing is derived by reference to the relevant CEN standards to which participants are accredited. All components of the Gas Measurement and Gas Cylinder PT Scheme are accredited to ISO EN 17043. Participants will be able to make measurements using 2 analysers for each pollutant for both the Gas Measurement and Cylinder components, thus allowing them to test different measurement technologies and calibration techniques.